F.C. 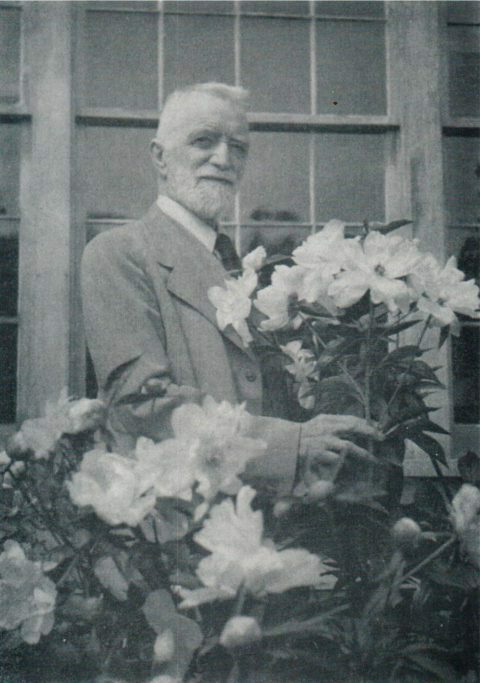 Stern was the author of one of the most important publications about peonies with his “A study of the genus Paeonia (read it online)” (published in 1946). 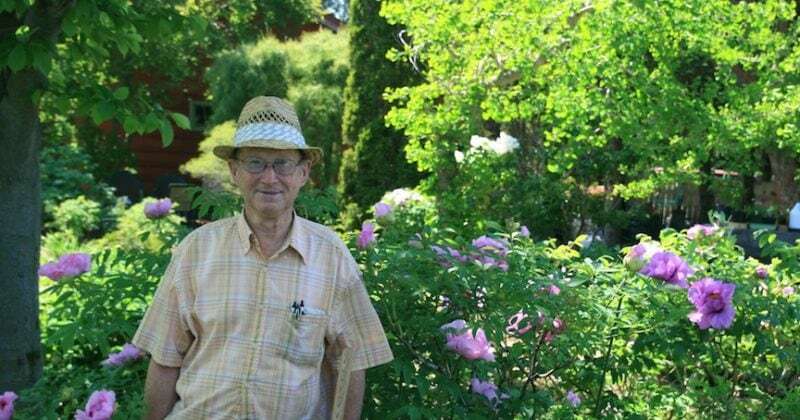 In 1954 he wrote an accessible article about the best species for “Gardening Illustrated”, a magazine, which was reprinted in the Paeonia newsletter of 1973 . It is quite good and as it primarily mentions species it is for the most part still a good read. 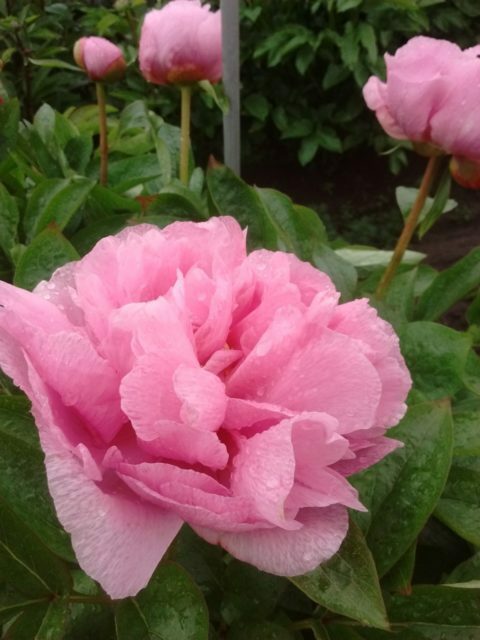 There aren’t that many people that have seen nearly all species peonies and his remarks are thus very interesting for those thinking about growing some species. Some of the species have since been reclassified and a very few have only been discovered after he wrote the article, to get a good overview, you’re invited to browse the species pages on this website. For small updates on this article: P. mlokosewitschii and P. wittmanniana are to be found with some others under P. daurica currently, P. lutea and P. delavayi have been lumped together as P. delavayi, P. veitchii and P. veitchii var. woodwardii are now both considered P. anomala, P. mascula has gotten some white subspecies since. The peonies usually grown in gardens are all derived from the wild P. lactiflora (syn. albiflora) from Manchuria and Northern China. 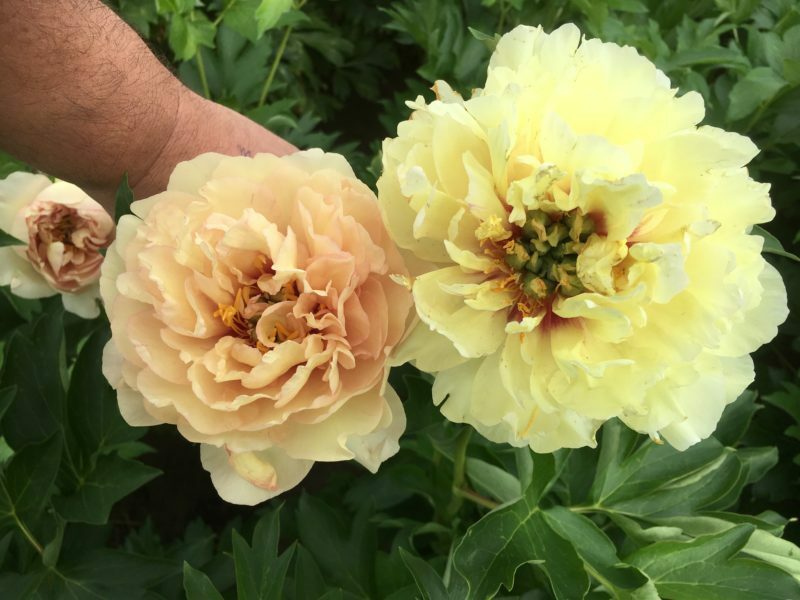 These lovely sweet-smelling peonies have been cultivated for generations by the Chinese and Japanese and in recent years by the western nations, and especially lately in the U.S.A. The seedlings vary very much both in colour and in form, some single and some double. The other “Paeonia” species, and first crosses between species, have been much neglected in the garden. These usually flower earlier than the lactiflora forms and many of them are most attractive, and easy to grow. They are accommodating as to soil; any good loam with or without lime suits them perfectly. Many of them like the half-shade and in this position the flowers last longer. Some people say they are difficult to move but I find that if they are moved as early as possible in October they will usually flower the following year. The earliest species to flower in the garden is P. cambessedesii. It comes out at the end of April or early May. The pink flowers are very beautiful, especially in contrast with the foliage, which is a deep silvery green and red beneath. It is hardy in the south, of England, but as it comes from the Balearic Islands it might want a south wall in gardens farther north. P. emodi from Kashmir is the next to flower. It grows into a large bush about 3½ feet high and is very lovely when covered with white flowers. This plant does best in the open border in full sun; it is such a fine plant that it is worthy of a good place in any garden. In May and June many species come into flower. The well-known European P. mascula, which used to be called P. corallina, with its red flowers, will grow anywhere and is useful in the garden to cover rough places. This peony was grown by the monks in the Middle Ages. Although it is indigenous to central Europe it is found in many parts of Europe and Asia Minor: in these outlying places it is usually found near the remains of a monastery, as for instance on the Island of Steep Holme in the Bristol Channel. The yellow herbaceous species make delightful plants with their gay flowers; they are quite hardy as they come from the Caucasian mountains. The best is P. mlokosewitschii, which has deep yellow flowers. It is a charming plant in spite of its unpronounceable name and is quite easy to grow. It does extremely well in half shade and the flowers last much longer in this position; in fact, it grows better there than in full sun. Another delightful Caucasian species with light yellow flowers is P. wittmanniana. It enjoys the same treatment as P. mlokosewitschii. All these species that do not grow too tall are very useful as ground cover for lilies. The low-growing P. tenuifolia is excellent in the rock garden. Its narrow dissected foliage is always pretty and shows off the deep red flowers to perfection. The late Professor Saunders, of Clinton, New York, made many crosses between species, some of which he sent me. The one I liked best was a cross between P. veitchii woodwardii and P. tenuifolia, which received an Award of Merit under the name of ‘Redwood’. 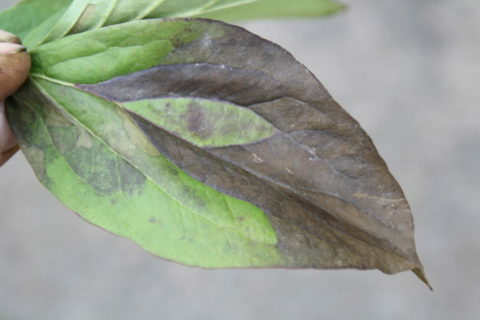 The dark green leaves are finely divided as in P. tenuifolia. It is an attractive hardy plant, taller than P. tenuifolia with larger red flowers. Another peony with narrow leaves is P. anomala intermedia. It grows taller than P. tenuifolia and has much larger flowers, very large for a species, the colour a deep red. 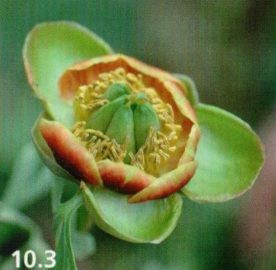 It is one of the finest flowers of all the species and there is a plate of it by Miss Snelling in my book “A Study of the Genus Paeonia”. The white-flowered P. obovata alba comes out later, usually at the beginning of June; it has a delightful cup-shaped flower and obovate leaves of a brown-green colour. It does not grow tall and likes a half-shady place. The variety “Willmottiae” is a larger form which is not so easy to grow as the type. One of the finest wild species is what Clusius called the “great red Peony of Constantinople,” P. peregrina; this peony grows wild in the northern Balkans. It is sometimes referred to as Fire King in nurserymen’s’ catalogues. The flower is a very bright red, cup-shaped, the leaves green shining and much divided. It is one of the latest, to flower, at the end of June or early July; it does extremely well in half shade and the bright, red flowers light up the shadows under the trees. 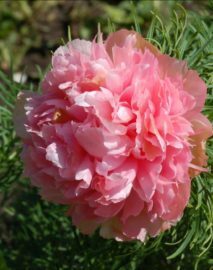 There are several fine forms of this peony in cultivation, but it is not possible to say whether they are hybrids or just variants that have appeared. The two best that I have grown are Defender and Sultan. Defender, which has received an Award of Merit at the R.H.S,, was introduced by Professor Saunders. It is a very strong-growing plant with the same cup-shaped flower as the species but of a deeper red and somewhat larger. It is easy to grow and is a first class plant. Sultan, whose history is unknown to me, appears also to be closely related to peregrina; it has even deeper red flowers which are larger than those of Defender. It is also a good garden plant but does not seem to be so strong as Defender. There is another form of this species found wild in the vicinity of Smyrna. It has the same cup-shaped flower and the same leaves as the Balkan form but the colour of the flowers is a salmon red; it is often known in gardens as ‘Sunbeam’ or P. peregrina lobata. The last of the herbaceous species to flower is P. veitchii and its variety woodwardii; a lower-growing plant. P. veitchii only grows about 18 inches high. It has several reddish, maroon-coloured flowers on each stem and is an accommodating plant, growing well in sun or shade. The tree-peonies are favourites of mine; these stately plants are not seen often enough in our gardens. They are not difficult to grow; a good loam, with or without lime, suits them admirably. They are perfectly hardy but have an annoying habit of making their new growth early in April. These new shoots, on which the flower eventually comes, start into growth suddenly and grow very fast; they are soft and tender at first and apt to be cut by frost or the cold east winds we sometimes get in April. I have seen Paeonia suffruticosa, the wild form, growing on top of the rock garden in Stockholm, which shows how hardy these plants are, though, no doubt, the young shoots do not start until after the frost is over. Therefore, one must try to place these plants in some part of the garden where they will be protected from the east wind and where they will not start too early into growth. I plant them in a half-shady place among shrubs or facing north where the young growth will be delayed. In this garden a number of them grow well in these positions, and all of them are well protected from the east wind. There are three wild tree peonies that are magnificent garden plants, all extremely hardy. P. suffruticosa, known as Rock’s Variety, which I have already mentioned, has large, white flowers, with deep red markings at the base of the petals. It grows into a big shrub. The plant in this garden is about 8 ft. high and about 10 ft. in diameter. It received a F.C.C. in 1943. The seed of the wild species was sent from China, by Dr. J. F. Rock, to the Arnold Arboretum in Boston, U.S.A., about 1930, and distributed by them. These plants, when they flowered, tallied with Farrer’s description of the wild plant which he found on his expedition to Kansu and describes so vividly in this book, “On the Eaves of the World”. Farrer, however, did not send back seed. The wild form of the beautiful Chinese and Japanese tree peonies, the Moutan peonies as they call them, was always rather a mystery. It would seem that all the different beautiful forms which have been evolved by generations of Chinese and Japanese gardeners have come from this wild plant. The new yellow tree peony, P. lutea Ludlowii, is a very fine plant, growing up to 6½ feet high. The flowers are a butter yellow, large and held well up above the foliage, and open in May. It was collected in 1937 by Messrs. Ludlow and Sherriff, in south-eastern Tibet. It is quite hardy and will grow in any soil, even on the rubble of the chalk cliff at Highdown. Seeds are freely produced and germinate well. This variety is a much better plant than P. lutea itself. The latter is a low-growing shrub with smaller flowers which are half-hidden by the foliage. Though P. lutea is a poor plant for the garden, it has been used very successfully by French and American hybridists to produce some fine hybrids which I will mention later. The other wild species is P. delavayi, also from China. This plant, growing up to 4 ft. or 5 ft. has large, deep maroon-red flowers; the size and shades of colour vary very much when the plant is raised from seed. The best forms with large flowers are decorative in the garden and useful as they will grow and flower under trees. Besides the Japanese and Chinese garden forms of these tree peonies, there are a number of good hybrids, raised by French growers and by the late Professor Saunders. The two I like best were raised by Saunders. ‘Argosy’, with large, single yellow flowers, grows into a large bush and is a fine garden plant when covered with flowers at the end of May; ‘Black Pirate’ has large, dark mahoganyred, single flowers and is very striking when in flower. The single forms appeal to me more than those with large double flowers, as in the French hybrid ‘Souvenir du professeur Maxime Cornu’. The flowers in these double forms are too heavy for their stems and in the garden hang down in any bad weather. Several of the single forms have been raised here; ‘Mrs. George Warre’ and ‘Cassandra’ are two of the best, but the trouble is to propagate them. It is difficult to strike them from cuttings; they will layer but this takes a considerable time. The best way is to graft them onto herbaceous peony roots, but this is a matter for the expert propagator. Many of the hybrids and the garden forms come well from seed, though germination is sometimes slow, and it is always exciting to see what the flowers will be like, as there is always much variation in their colour and form. The Peony Society 1 year, 1 month ago.